You are invited to take part in the second JTYAF charity trout fly fishing event at Holbury Lakes near Romsey. If you have never fly fished before you should find it a very enjoyable and sometimes challenging experience which will hopefully get you 'hooked' and wanting to go again. The lakes have been closed for the day for this event. Ticket price is £75 for 4 fish which includes a donation to the charity and a day rod licence if required. All tackle will be provided. Tea and coffee will be served during the day and BBQ hot dogs will be provided at midday. This event is open to all. There will be experienced anglers on hand who can give tuition on casting, fly fishing techniques and an understanding of the sport. For those who have not fished here before, it is an extremely scenic location in the Hampshire countryside and reaching a bag limit of four trout is achievable. There will be a prize for the biggest fish and heaviest bag of fish. Same person can only win one prize!! one of which is a three fish day ticket. This should be a very enjoyable and social occasion whilst catching some of the hard fighting blue, rainbow and brown trout that the fishery is well known for. Fishing starts at 9.00 am but please arrive from 8.30 to allow for tickets, tutor and tackle allocation and safety briefing. Wellies, hat and sunglasses advisable. We’re delighted to invite you to a fabulous event at a beautiful local venue. Ascot Ladies Day comes to Merley House, on Thursday 20th June! 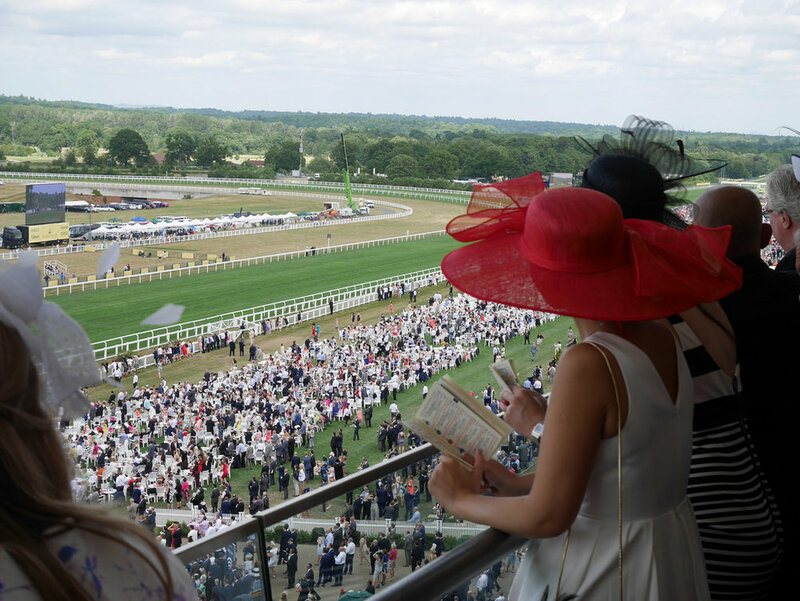 A large TV will show the Races live from Ascot Ladies Day all afternoon and a Sweepstake for an additional £10, will add a little interest to the proceedings with cash prizes for the winners. Dress to impress!! There will also be a prize for the most impressive hat. 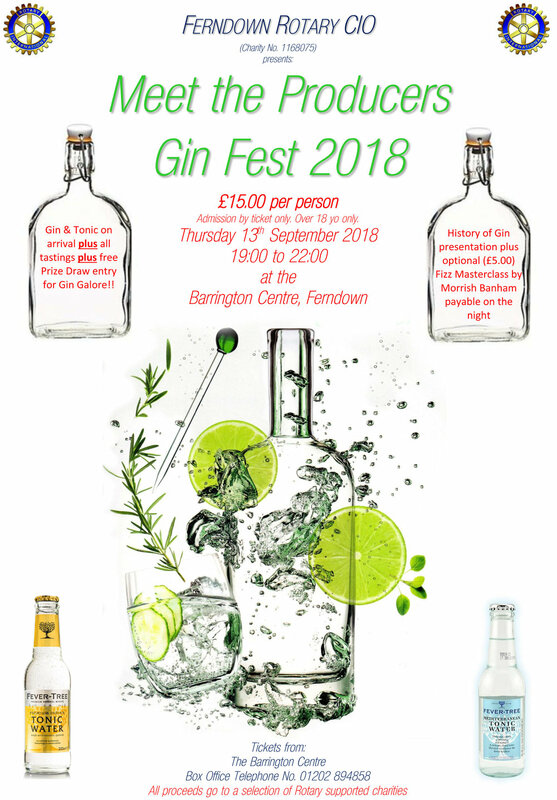 Ferndown Rotary Club have chosen John’s foundation as the recipient charity for this event and we are extremely grateful to them for their continued support. The Winning Team in 2018 - A great tribute to John! On Saturday June 22nd, as part of the Fete of the Field in Ferndown, the John Thornton Pram Race is back! Bigger and better than ever. The Prams will take to the starting line on King George V Playing Field at 3pm and follow a 1.5 K course with various fun challenges and activities along the way. Competitors must be over 14 years of age and an entry fee of £10 per person is payable on registration. (£5 for under 16 years). If you don't want to miss out on this fun packed event you need to get a team together and sign up today. You will need a minimum of 2 people up to a maximum of 5. Teams will consist of a baby and at least one pusher up to a maximum of one baby and 4 pushers. Obviously, you'll need a pram too and dressing up is essential! We’re hoping to have an exciting line up of prams and this year the addition of an optional Drag Race will add to the fun. Prams will compete against each other and the clock, with a prize for the winning team. There are lots of prizes and trophies on offer, but the main focus of the event is fun fun, fun! If you feel like you are up for the challenge and have any questions please phone Pete Thornton today on 07792121645 or register your interest by completing the form below. This event will be raising funds solely for the John Thornton Young Achievers Foundation. Thank you! We will let you know as soon as more details become available. Back, bigger and better for 2019. It's the 5th year of the best event in Poole, with a full day of live music, vintage market, vehicles and the koolest kats in town! The Junco Shakers - The Blue Cadillacs - The Aphrodites - The Blue Stockings and Rip It Up. A great line up with more to be revealed and its all for free!!! This year there is a bigger classic car area, more space for the Vintage market and many more little surprises!! The John Thornton Young Achievers Foundation is privileged to have been chosen as the charity of support for this event. Huge thanks to Karl - Real Vintage. We’re really looking forward to seeing you all so please make sure you come and say hello. The Dorset Plane Pull is one of our favourite events and involves teams of no more than 20 people pulling a Boeing 737, weighing in at 35,000Kg, a distance of 50 metres in the quickest time possible. Organised by Richard Griffin, and Peter and Kyrie Feltham this will be the 11th Dorset Plane Pull and it is sure to be a fantastic event. If you think you have what it takes and fancy something a bit different, get a few mates together and enter as a team. Alternatively why not register as an individual. You don’t have to pull to enjoy the event, watching is just as much fun as taking part. The day plays host to a number of other activities including BBQ, stalls, live entertainment and even something for our younger spectators. Come along, spread the word, support the teams. Invite your friends and family to come and join in the fun. To find out more visit: www.planepull.co.uk and also like the Dorset Plane Pull page on Facebook which will keep you up to date with all their news. Phone Pete on 07791 121 645 or you can register your interest by completing the form below. Thank you for registering your interest. We will be in touch ASAP! 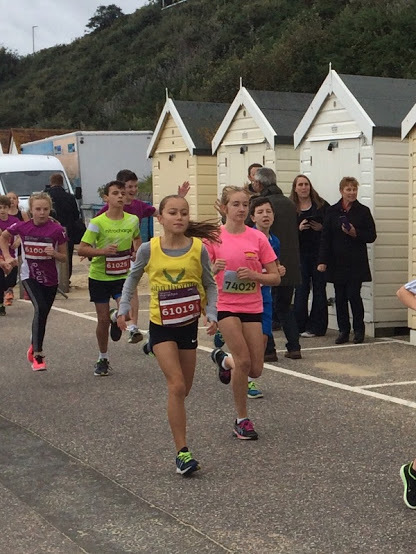 Do something amazing for 2019 – Join Team JTYAF for the Bournemouth Marathon Festival and make a real difference to local young people’s lives. There’s a wide variety of races available, giving everyone the opportunity to get involved – so why not sign up and join Team JTYAF today? Entrants who run for the JTYAF will know that every step they take, and every pound they raise, will make a huge difference to the lives of local young people. We ask you to support the JTYAF as an ‘Own Entry’ runner. Own Entry runner means that you apply and pay for a place in your chosen race and then opt to raise money for the JTYAF. This way the charity is not charged for your place and there is therefore no minimum sponsorship commitment. We do however hope that you will raise as much as you possibly can and we’ll do all that we can to support you. To apply for an own entry place visit the BMF homepage. If you could let us know that you are supporting us on the form below that would be brilliant. JTYAF Curry Night SOLD OUT! Back by popular demand the JTYAF Curry Night at the Cinnamon Lounge, Verwood. A delicious 5 Course Buffet just £20 per person which includes a £5 donation to the charity! If you’d like to take part in a fabulous fun run this Festive Season, the 10th Wimborne Rotary Santa Fun Run will be held at Badbury Rings point-to-point course on Sunday 9 December. The Ferndown Christmas Lights will be switched on by the Mayor of Ferndown - Cllr Mrs Jean Read at 5pm under the clock tower. From 1pm in Penny’s Walk Ferndown there will be stalls, music, bands, Santa, a raffle, nativity scene, games, rides and more! Come down and see the JTYAF stall where we will be doing a children’s prize draw with a prize every tune. Thank you to Ferndown Rotary Club and their President for all their help and support this year. JR's Disco is back for one night only and with a Halloween theme it is definitely a party you don't want to miss. 7.30pm - 12 midnight, Dressing up is essential! Do something amazing for 2018 – Join Team JTYAF for the Bournemouth Marathon Festival and make a real difference to local young people’s lives. The JTYAF have pre-paid for a limited number of Charity Place Runners and they are therefore expected to raise the minimum amount of sponsorship stated for their chosen event. If the minimum sponsorship level isn’t reached it will result in financial loss for the charity (a marathon place costs the charity over £150). The registration fee is incorporated into the minimum sponsorship amount and charity place runners will be required to submit at least 50% of their minimum sponsorship no later than 2 weeks before race day. Entry as an Own Entry runner means that you apply and pay for a place in your chosen race and then opt to raise money for the JTYAF. This way the charity is not charged for your place and there is therefore no minimum sponsorship commitment. We do however hope that you will raise as much as you possibly can. As an own entry runner, we’ll provide you with the same benefits as a charity place runner. To apply for a charity place visit the JTYAF entry page, choose your race and then just follow the instructions. To apply for an own entry place visit the BMF homepage and then tell us that you are running for the JTYAF through ‘my details’ in your account. Our 7th Companion Dog Show kindly organised by Nicky and David Smith, Barbara Astle and Pam Rutley, will be held at West Parley Memorial Hall on Saturday 29th September. So why not save the date in your doggy diary? There will be a photographer available on the day too - huge thanks to Les Deszo for providing his services. PROMOTER ACCEPTS NO RESPONSIBILITY FOR ANY DAMAGE HOWSOEVER CAUSED. The Bournemouth Air Festival now recognised as one of the top ten air shows in the world returns to its stunning seafront setting from 30th August to 2nd September. This year’s John Thornton Young Achievers Foundation VIP Hospitality Day will be held on Sunday 2nd September. We are offering a fantastic VIP experience at the heart of Bournemouth's premier event. Why not treat yourself, or buy tickets as a gift for someone special? There may also be the opportunity to meet passing display teams who pop into the marquee for refreshments! The Plane Pull is one of our favourite events and this year will mark it's 10th Anniversary. The JTYAF has been supported by the event from the very beginning and we are hoping that this will be a really successful year as the JTYAF is also commemorating 10 Years since it's formation. In 2017 our old faithful's ‘Stig’s Boys’ pulled with a fantastic time and who knows maybe 2018 will be their year! The Dorset Plane Pull involves teams of no more than 20 people pulling a Boeing 737, weighing in at 35,000Kg, a distance of 50 metres in the quickest time possible? Organised by Richard Griffin, and Peter and Kyrie Feltham this will be the 10th Dorset Plane Pull and it is sure to be a fantastic event. If you think you have what it takes and fancy something a bit different, get a few mates together and enter as a team. Alternatively why not register as an individual. We'll be in touch regarding your participation in the Dorset Plane Pull shortly! The 2018 John Thornton Pram Race. We are organising a group 10 mile walk on Saturday 9th June, from Sandbanks to Mudeford, with a couple of stops along the way and finishing with lunch. Ferndown Rotary Club have selected the JTYAF as one of their chosen charities for thier annual Charity Golf Day. The event is sponsored by Hendy Group and normally attracts about 30 teams. For a team of 4 the cost is £200. If you would be interested in taking part or sponsoring a hole (£100 per hole) please contact Pete on 07792 121 645 to register your interest. The JTYAF is absolutely privileged to have been chosen as 'Charity of the Year' by Sainsbury's Ferndown and be invited to collect instore on this busy shopping weekend. We're expecting to have a couple of celebrity visitors. Mickey and Minnie Mouse will be making an appearance! Please come and say hello and if there are any little people would like their photos taken with either Mickey or Minnie or both, they would be delighted to see them. The JTYAF always add a bit of fun to your shop so why not come along and see us. You are invited to take part in a JTYAF charity trout fly fishing event at Holbury Lakes near Romsey. The JTYAF always add a bit of fun to your shop so why not come along and see us on 13th & 14th April. Join us for a fabulous Vintage Tea Party. Granny's China Cupboard are kindly providing beautiful vintage china for our delicious Afternoon Tea. So why not treat yourself to an afternoon which will take you back to a bye gone era with entertainment from the amazing Real Vintage and their re enactment friends and dancers. There will be an exciting raffle too. All this for just £5 per person. Definitely an afternoon not to be missed. Also available for an extra charge will be strawberries with a free prosecco! Huge thanks to Vicky Parnall of Granny's China Cupboard for supplying her beautiful vintage china for this event and also to Karl from Real Vintage who is providing the entertainment free of charge. I am interested in this event, please keep me informed. Send your details below. The JTYAF is absolutely privileged to have been invited to Sainsbury's Ferndown for this major Christmas shopping weekend. We're in the process of organising choirs and volunteers and there will bet lots going on. We will certainly make sure that the lovely Sainsbury's customers have a bit of Festive Sparkle while they shop. We'll let you know the details as soon as we have everything confirmed but put the dates in your diary and make sure that you come down and see us - shopping will definitely be a bit more fun with the JTYAF around. The Bournemouth Male Voice Choir will be singing at 11am - not to be missed! Run or walk the 2 or 4 mile course in a Santa Suit and you are a winner! Please down load your individual entry forms here, team forms here. It's a fun event and a great way to raise funds for the JTYAF. Every step you take will be helping us to support local young people. Download a sponsor form here. Join us on Friday 8th December at M&S Food Hall in Ferndown for a collecting day and epic raffle with amazing prizes! Join us on Saturday 9th December, 10am - 4pm. Do something amazing for 2017 – Join Team JTYAF for the Bournemouth Marathon Festival and make a real difference to local young people’s lives. Our 6th Companion Dog Show kindly organised by Nicky and David Smith, Barbara Astle and Pam Rutley and sponsored by Christchurch Chiropractic Centre, will be held at West Parley Memorial Hall on Saturday 30th September. So why not save the date in your doggy diary? This year we will be raising money for Poole Hospital Radio Therapy Unit - a cause very close to our hearts. Kindly organised by JTYAF Trustee Joe Barnett, this is a great fundraising challenge. The Challenge: Walk from Sandbanks to Lymington in 1 day as part of a fundraising team for the fantastic local charity – JTYAF. Arrangements: Meet Saturday, September 9th At Jazz’s Café, Sandbanks at 8.00. The route will follow the coastal path with numerous toilet and refreshment opportunities. A steady pace with breaks will result in an arrival time at Lymington of 6.00. To mark the end point of the challenge we will have a pub meal at the Ship Inn with the return transport provided departing at 8pm, returning to Poole at 8.45. Option 1 Sandbanks – Highcliffe. Arriving at Highcliffe at approx.. 1.30. There are frequent returning buses. Option 2 Highcliffe to Lymington. Meet at Highcliffe at 1.30 to join the adventure including pub and return minibus. To support Joe and his team please visit their JustGiving page. The Bournemouth Air Festival now recognised as one of the top ten air shows in the world returns to its stunning seafront setting from 31st August to 3rd September. This year’s John Thornton Young Achievers Foundation VIP Hospitality Day will be held on Sunday 3rd September with a Vintage theme. The Vintage Sunday will include The Great War Display Team which comprises 10 replica WWI aircraft (British & German) dog fighting (with smoke and simulated machine gun fire), directly in front of the hospitality marquee finishing with a display by 5 vintage jet aircraft. The Land Girls will be entertaining guests as they arrive. The Plane Pull is one of our favourite events and we are hoping that this will be a really successful year for the JTYAF. In 2016 our old faithfuls ‘Stig’s Boys’ pulled with the 'Midas Men' and came a fantastic 2nd in the 20 team members and below category! The Dorset Plane Pull involves teams of no more than 20 people pulling a Boeing 737, weighingin at 35,000Kg, a distance of 50 metres in the quickest time possible? Organised by Richard Griffin, and Peter and Kyrie Feltham this will be the 9th Dorset Plane Pull and it is sure to be a fantastic event. If you think you have what it takes and fancy something a bit different, get a few mates together and enter as a team. Alternatively why not register as an individual. The inaugural John Thornton Pram Race. Pete and Kirsty are taking on the Three Peaks Challenge for the JTYAF and Cancer Research on 1st July and have organised a fantastic Quiz Night as part of their fundraising activities. The Since 1664 Yomp is a Royal Marines focused event and supported and promoted by the Royal Marines Charitable Trust Fund, but the JTYAF is privileged to have been invited to take part and we have bought three charity places. Since 1664” 2014 was a unique Yomp, coinciding with the Royal Marines’ 350th Birthday and the event is now in it’s 4th year. For 2017, the challenge is 100 miles. Departing from King Alfred's statue soon after first light on Saturday 27th May and following the official 100 mile route, with minor detours to get to suitable scran points and finishing just beyond the bottom of Beachy Head a full 166.4Kms gets Yomped! Every serving or veteran Royal Marines Commando who has undertaken this Yomp has said that it is every bit as challenging as any of the Commando Tests. The climb (and decent) is the equivalent of 40% of Mount Everest but over 100 miles and in 36 hours. It is further than London to Portsmouth. It is a huge physical challenge, but it is an even more immense mental test. If you are interested in taking on the Since 1664 Yomp for the RMCTF and the JTYAF please contact us for the charity discount code. We will ask for a minimum amount of £500 to be raised in sponsorship. The first £166.40 of any sponsorship raised will go to the Royal Marines Charitable Trust Fund (RMCTF) and the £150 entry fee will be returned to the JTYAF. Of the remaining £183.60 20% (£37.72) will go to the RMCTF and the JTYAF will receive £146.88. So if you raise at least the minimum £500 the RMCTF will benefit by £204.12, the JTYAF £146.88 and the event costs will be covered too. Everyone’s a winner! However, we hope you’ll raise even more than £500 in support of these two great charities. Take on the Press Up Challenge ! Royal Marine Richie Puttock and his team are taking on a 'press up' challenge at Sainsbury's Ferndown.